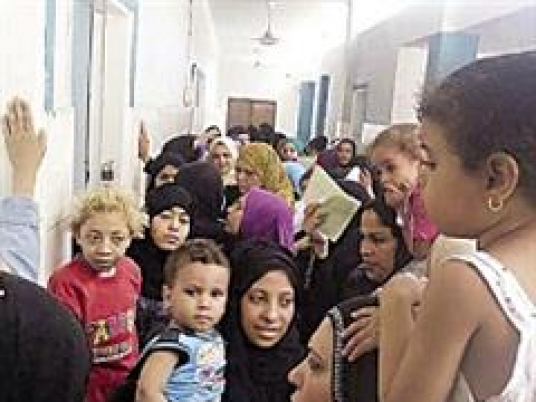 Attached to a statement on Sunday, the syndicate published online photos of patients packed into in badly ventilated lobbies of the Dermatology and Leprosy Hospital in Omraniya, Giza. Some photos showed recently-graduated doctors sitting in cramped rooms with several small fans that do little to improve the heat and poor air quality, said the syndicate in the statement. The hospital says that it receives hundreds of cases per day and cannot accommodate the large numbers of patients who arrive, due to a severe staff shortage. Meanwhile, ministry officials are unresponsive to this issue. The syndicate declared that the ministry’s high-ranking officials are the only ones who are sitting in cozy, air-conditioned rooms, while patients and doctors suffer from heat-related conditions which may lead to death. Meanwhile, the Undersecretary of the Monufiya Health Ministry, Dr. Mohamed Azmy, said that the doctors who published the photos are doing so for self-interest. One of the female doctors published the photos on Facebook in order to force officials to install air conditioners in the in-patient clinics, an act that would greatly affect the power sector, added Azmy. She also asked for a limited number of cases per day, which Dr. Azmy believed is inappropriate, adding that it is unreasonable to install air conditioners throughout the hospital for a short-lived heatwave. The syndicate called for a protest in front of the Health Ministry with the participation of some of the organization’s council members. They will demonstrate for their right to train in Egypt’s elite hospitals since other doctors who have connections have been given priority to work there. The syndicate declared that the expected protest will demand equal training opportunities for all, as well as the issuance of a ministerial declaration which will give a clear description of how doctors are selected for work in public or private hospitals.